Once a seller begins to market for the sale of a business, employees become aware and become concerned about the security of their employment. In most cases, there are certain key employees whose continued involvement in the business is essential for its success. A buyer’s willingness to continue employing these employees may likely be a necessary condition upon which the buyer must agree to, for the transaction to go through. There may be other employees who may not have a long-term future with the prospective buyer but are nonetheless important for the closing of the sale of the business or to assist with post-closing matters of transition and integration. These considerations may be critical especially for financial buyers who do not have managerial experience in the target industry or the necessary infrastructure. Our business lawyers can help establish retention programs to sufficiently incentivize these key employees to remain with the buyer for a specific period of time. The employee retention agreement and arrangements will hinge on the employees’ existing pay, their wealth from independent sources (or even, potentially, from the acquisition itself), the desirability of keeping them on-board for post-acquisition matters, their skills and prospects of new employment, and the existence and enforceability of noncompete agreements. 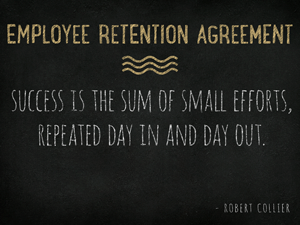 Our corporate lawyers have experience in drafting and negotiating employee retention agreements. We will review agreements and determine whether circumstances dictate that the seller and/or buyer ought to consider offering key employees new employment agreements, stay bonuses, separate severance arrangements, or other contractual incentives to ensure the employees remain with a target buyer for an adequate and necessary period of time. It is likely that key employees will already be bound by an employment agreement, confidentiality agreements and noncompetition agreements. These agreements may discourage these employees from voluntarily leaving their current employer. These agreements should be reviewed to determine how and if they apply in the context of sale of a business and whether they allow for the desired result in the transaction. Our Chicago corporate lawyers will review agreements and determine whether the circumstances dictate that the seller and/or buyer ought to consider offering key employees new employment agreements, stay bonuses, separate severance arrangements, or other contractual incentives to ensure the employees remain for an adequate and necessary time period. The terms of retention agreements, the amount of consideration, and the timing of any payments will be dictated by the circumstances and the buyer and seller may negotiate on which party will take on the responsibility for the retention payments.